In 1873, the City of Poughkeepsie announced it was going to improve Tulip Street, a short thoroughfare on the south side with a clear view of the Hudson River. Some residents complained the project would increase their taxes, but the city graded and curbed the street anyway. A century later, in 1973, the city made another announcement regarding Tulip Street, named so because its residents grew the finest tulips in town. This time, the plan was to close it down. And so, the small street parallel to Rinaldi Boulevard became a casualty of the city’s urban renewal effort. During those 100 years, Tulip Street was lined with homes filled by families. Nearby was a factory that made plows and other farm equipment. Frank’s Brewery served up frothy, amber suds. Across the way was the DeLaval Separator Co. But in the last 40 years, there have been only memories and a parking lot. Now, change is coming again. The Bonura family, which owns Shadows on the Hudson and The Grandview right across the street, has begun laying foundations for a 136-unit apartment complex at a 5.5-acre site where Tulip Street once conveyed people and commerce. The project, dubbed Water Club Luxury Living, is the latest in a series of developments breathing new life into the city’s waterfront and downtown areas. Development of the waterfront has long been seen by local leaders as a key to economic growth for the city and Dutchess County and for attracting younger people to offset the aging local population. Just across the street, the Bonuras are planning another residential and commercial complex at the DeLaval site. To the north, a large residential project is planned for the former A.C. Dutton Lumber site. In the downtown district, developer Jon Behrends is moving forward with a restoration of buildings at the corner of Academy and Cannon streets. Meanwhile, city leaders are seeking a chunk of $10 million in downtown revitalization funding from the state. And in March, Fourth State Metals, a company that designs and fabricates art and architecture, announced it had purchased a vacant warehouse on Cottage Street and would move its operations from Brooklyn. At the Water Club complex, apartments will range in size from 780 square feet for a one-bedroom floor plan, to 1,995 square feet for a two-story, two-bedroom penthouse unit. Rents will be from $1,250 per month to $2,950 for the penthouse units. The complex will feature concierge service, a heated parking garage, electric car-charging stations, a pool with cabanas, outdoor barbecue grills, a dog park and dog-washing rooms, a gym, club room and rooftop terrace. Each unit will have a balcony, the half on the west side enjoying views of the Hudson River. The total investment by the developers will be just shy of $30 million. “What we are trying to do is build the nicest rental building anywhere in Dutchess County,” Joe Bonura Jr. said. The project is scheduled to be completed in April 2017, though developers say they plan to have the first tenants in by the fall of this year. And just up the hill, Vassar Brothers Medical Center is moving forward with a $466 million hospital expansion, a project that is sure to bring some tenants. It comes at a time when demand for rentals in Dutchess County is high. Vacancy rates have hovered between 2 and 3 percent in recent years, according to county surveys and local brokers. 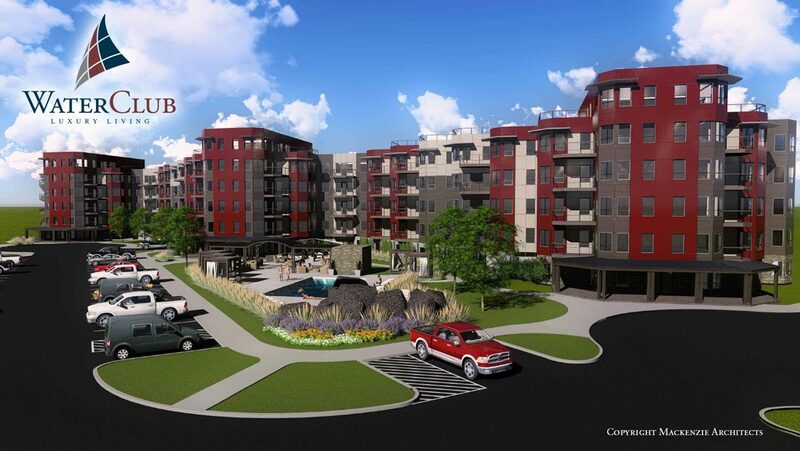 Nine future tenants have already signed pre-lease agreements, despite a lack of advertising. Jason Holmes, a 40-year-old Rhinebeck resident, is one of them. Residents will be in walking distance to city restaurants and some shops, the Metro-North train station and Walkway Over the Hudson State Park. “Getting that critical mass of residents to support redevelopment … is critical to making sure the waterfront is a resounding success,” said Peter Barnard, an urban planner with Scenic Hudson, the Poughkeepsie-based environmental nonprofit which consulted on the project’s design. The target market is millennials and empty-nesters looking to downsize. The site has long been known by its staid, bureaucratic name — PURA 14, which stood for Poughkeepsie Urban Renewal Agency site No. 14. Its transformation dates back to 2001, when the Bonura family was selected by the city to redevelop three parcels — the site of the city’s former sewage treatment plant, now Shadows/Grandview; PURA 14; and DeLaval. All three had contamination from their previous uses, and the Bonuras have cleaned up each through the state’s Brownfield Cleanup Program. The program offers tax credits to developers who pay for cleanups certified by the state Department of Environmental Conservation. PURA 14’s contamination was linked to industries that included the Moline plow company, an artillery shell manufacturer, a rail yard and a chemical fertilizer manufacturer. The original plan was to have the city pay for the cleanup and sell the property to the Bonura family. But once it became clear the cleanup would cost more than the city would get for selling the property, a new deal was crafted. The Bonuras took on the cost of the $2.2 million cleanup in exchange for a 99-year lease in which they pay the city’s Industrial Development Agency $1 a year. The cleanup received its certificate of completion from the DEC on Dec. 6, 2010. The city and the developers negotiated an annual payment in lieu of taxes amounting to 2 percent of any revenue generated from rents or any other fees. “The better we do, the more money the city makes,” Bonura said.